Bring home this Krishna idol with flute and get mesmerized with the intricately designed ornaments. 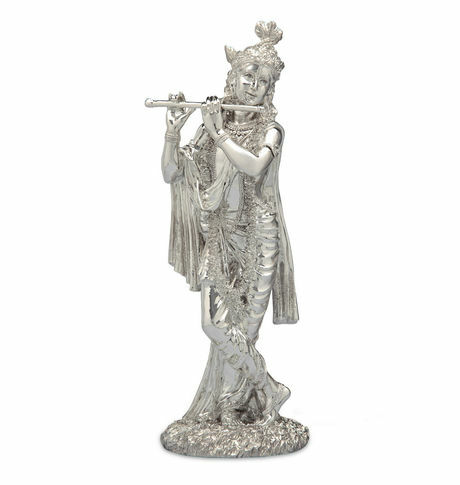 This exquisite idol is ideal to decorate your ritual room. The idol is also a worthy gifting article to discerning patrons. Easy to maintain. Bring home this Krishna idol with flute and get mesmerized with the intricately designed ornaments. This exquisite idol is ideal to decorate your ritual room. The idol is also a worthy gifting article to discerning patrons. Easy to maintain.Cancellation and Return Policy: • Exchange allowed post booking • No order cancellation or Refund transaction allowed at the store.